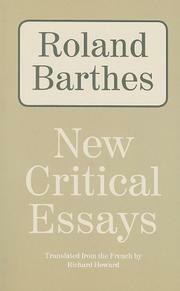 Eight not-so-new essays, as ingenious and exasperating as ever, by the late M. Barthes. These pieces, which date from 1964 to 1971, were originally published along with Le degré zéro de l'écriture in 1972. They add nothing of substance to the Barthesian canon (most are brief reflections on classic, or at least familiar, French authors, from La Rochefoucauld to Proust), but they provide a sampling of all that is most brilliant--and most dubious--in the work of the great Structuralist mandarin. For all his scientific pretensions (and his pedantic love of abstruse terms), Barthes was a poet. His style, to which translator Richard Howard does almost perfect justice, positively caresses the literary object with a sort of refined intellectual voluptuousness. (Discussing Pierre Loti's novel Aziyadé, Barthes savors "the sensuous, plump palatization of the y" in the title.) This uncanny sensitivity, along with his formidable analytical skills, makes Bartles an illuminating guide to things like Chateaubriand's Life of Rancé or the use of names in Proust. Still, what Barthes actually does with literature often seems irrelevant or downright destructive--less concerned with the text than with weaving interpretations around it. Aziyadé, he says, is an insipid novel--but the disjunction separating Julien Viaud (the author, a naval officer and world traveler), Pierre Loti (his pseudonym and literary self), and a second Loti (protagonist of the story) creates all kinds of opportunities for Structuralist gymnastics. This indifference to content in the traditional sense reminds one of nihilism, and in fact at one point Barthes observes that in literature, as in life, "there is ultimately nothing to understand." But still worse is Barthes' penchant for oracular utterances, often obscure (what is "a nascent schizophrenia, prudently formed in a homeopathic quantity"?) and always dogmatic ("antithesis is. . . a mechanism quite devoid of meaning"). This can lead, at best, to a string of thought-provoking dicta, but in any case it fails to leave the reader with a coherent view of the work in question.